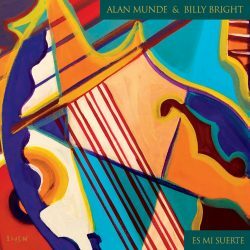 The latest project from mandolin player Billy Bright and banjo player Alan Munde, Es Mi Suerte, showcases instrumental mastery of all styles of acoustic roots music. Eight of the ten songs are originals, capturing the spirit of traditional and progressive bluegrass, 1950s folk, Texas waltzes, a blend of "Tex-Mex-Cajun" and a tinge of country gospel. Bright and Munde are joined this time around by Billy's bandmates of Austin's terrific, Wood and Wire, musicians who also know their way around acoustic roots music. "Jenny's Desire," Wild Heron," Moms' Waltz," "Oklahoma Bound," "Es Mi Suerte," "Dapple Patti," "Munde Night Waltz," "By the Side of the Road," Going Bodmin," and "Goodnight Irene." If you have problems with downloads, please contact me at alan@almundesbanjocollege.com. Please do not contact PayPal. Thank you. I began the mail order business many years ago but it has been dormant for the last several years. I have decided to get back into the business in a rather small way for now. The business is truly of the cottage variety. Many of the tab items are self- produced without the aid of a computer, although some are published through Mel Bay and look right nice. I like to say of the self-produced tab, it’s in my handwriting but you will learn to love it (that’s my hope). Some of the CDs are self-produced (quality, studio produced bluegrass). As I progress and get more time, I will upgrade and blast into the 1990s and get better at computer programs. Until then I hope you find some things that will bring you joy both as a listener and a student of the banjo. GREAT AMERICAN BANJO SONGBOOK – Created by gifted composers and lyricists, the songs that comprise the The Great American Songbook are the most influential popular and jazz standards of the early 20th century to come from Broadway stages and film screens. These American standards have been celebrated by vocalists for decades, and Hal Leonard is proud to offer them to a new audience. This 70-song collection, masterfully arranged by Alan Munde and Beth Mead-Sullivan for 3-finger, Scruggs-style 5-string banjo, will help players explore the repertoire already beloved by pianists and crooners. Rhythm tab, right hand fingerings and chord diagrams are included for each of these beloved melodies. Songs include: “Ain’t She Sweet,” “All of Me,” “Blue Skies,” “Cheek to Cheek,” “Embraceable You,” “Fly Me to the Moon,” “Home on the Range,” “It Had to Be You,” “The Nearness of You,” “Over the Rainbow,” “Pennies from Heaven,” “Stardust,” “Sweet Georgia Brown,” and many more. 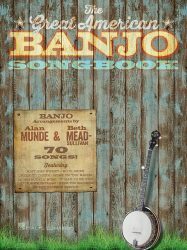 ALAN MUNDE DOWNLOADABLE BANJO TABS! – Now you can download select Alan Munde tabs ala carte! These first offerings are from the Country Gazette album “Strictly Instrumental.” Pick and choose the tune you want or get the whole set at a discount. All downloads include Tab in pdf format and solo MP3. Tabs are $2.95 each or buy the whole set for $15! Billy Bright, a great friend and wonderful musician, lives very near by, and for several years we have been making music together in various formats (see Two High String Band – Hot Texas Burrito). Here we are playing in a duo format – just banjo and mandolin (I grew up musically on the sound of Doug Dillard’s banjo and Dean Webb’s mandolin in the Dillards – always loved that sound). We have put our heads together and come up with the 13 pieces recorded on Bright Munde – 10 original, 2 traditional, and 1 Bill Monroe number. It was a real creative boost for me to work with Billy. What was way cool is that he made my few original numbers make sense and really come to life. Hope you enjoy the banjo and mandolin music we made.